In one of my first trip through Africa (1982), I landed in Arusha to travel South to reach Johannesburg with means of transport that I would find along the way. I got a special permission from my job to be absent for one month within which I should have made it through Africa. I left with a bit of fear but no worries as I did not know what could I worry about. 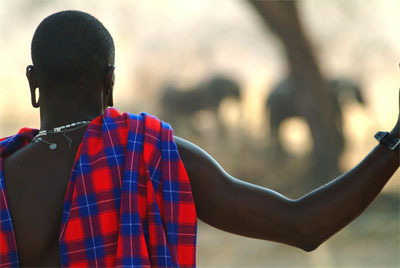 I left the North of Tanzania after traveling through the parks and headed towards the land of the Masaai. I took an inside track, on a broken down truck that had to carry goods to Dodoma. I remember it so well, as if it was today, that land of dry yellow grass, some rounded huts, like small domes. Dark mud and some twigs sticking out. But all nice and neat. The land around the hut was wiped nicely and clean. I got off the truck and wanted to meet the families living there…. A handsome Masaai came towards me and greeted me in his way. The truck driver tried to translate. I liked that young tall, strong Masaai. He wanted to “marry” me…. that’s how the translation was… most likely he only wanted an affair… I gave him a neckless I had around my neck, he gave me his bracelet. The old lady of the village came to meet and we all decided that I would not have been the best of the wife he should have aimed for…. – I left with a nice kiss on my cheek, a kiss he did not know what it was.